Denmark’s immigration ministry published advertisements in Lebanese media aimed at discouraging migrants from coming to the country. The adverts, published in four Lebanese newspapers, note that Denmark has reduced social benefits to migrants significantly, that those given asylum will not be allowed to have their families brought to the country during the first year, that a residence permit is delivered only to those who speak Danish, and that rejected asylum seekers are swiftly sent back to their home countries. Lebanon, a country of 4 million, is hosting 1.1 million Syrian refugees. Danish social media reacted sharply to the publications, many opinions noting that the Danish authorities’ move sharply contrasts with Germany’s welcoming attitude to refugees. The measures were one of the first announcements made by the new right-wing government following a parliamentary election in June. The immigration ministry said Denmark seeks to reduce the number of asylum seekers, but still expects 20,000 refugees this year compared to 14,000 in 2014. In fact, Europe’s refugee crisis has already spilled into Denmark yesterday (7 September) as some 800 people entered the country from Germany and tried to head to Sweden. Prime Minister Lars Løkke Rasmussen told journalists after an emergency meeting of party leaders that most of the 800-1,000 refugees who had come to Denmark since Saturday would not seek asylum in the country. Rasmussen, head of a new minority government dependent on support from a right-wing party, said border controls were no solution, criticised European Union states for not following rules on asylum seekers and said refugees who had entered over the weekend must register in the country. The prime minister said the refugees should seek shelter for the night and wait until Danish police coordinated their transfer to Sweden with Swedish authorities. “We hopefully can reach a situation where people who want to seek asylum in Sweden can do that,” he told journalists. “As a Danish authority, we cannot support people getting to Sweden, if it does not happen with a degree of acceptance from the Swedish authorities,” he said. Danish television channels on Monday showed videos of refugees taking trains from Jutland, in the western part of Denmark connected to Germany, to Copenhagen, where they can ride to Sweden in 35 minutes by train. Other videos focused on several dozen refugees walking along a busy motorway to Copenhagen because, as they said, they wanted to join their families in Sweden, or expected to have relatives join them there far more quickly than in Denmark. Sweden has taken by far the largest number of refugees per capita in Europe. With over 80,000 asylum seekers accepted last year, it is second to only Germany. Rasmussen’s Liberals Party formed a government in July after winning 34 seats out of 179 in Denmark’s parliament. During the election campaign, all parties sharpened their rhetoric against immigration. The right-wing Danish People’s Party won more seats than the Liberals, but refused to join the government, believing it would have more influence over policy outside of the cabinet. Its leader, Kristian Thulsen Dahl, has blamed Germany for the stream of refugees into Denmark and argued for border controls, so refugees coming from Germany could be sent back, according to the Dublin agreement on registering asylum seekers. “German politicians must take responsibility for what they have done by opening the border and welcoming people from the south,” he said. In a Facebook post, he stated that Germany’s decision to receive Syrians had broken the Schengen agreement. The prime minister explained that he had spoken to German Chancellor Angela Merkel on Sunday (6 September) and that only a European solution would solve the crisis. 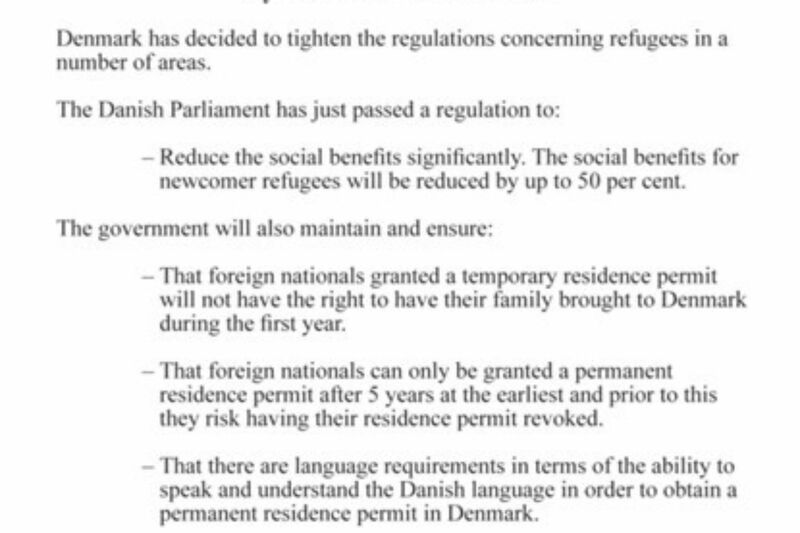 Danish rules on accepting refugees are seen as stricter than in many other European countries. “I think it is clear for everyone that the European asylum system is under huge pressure and in fact broken in some cases,” Rasmussen said before the parties met.